The 14th November, 2009 saw the Dorset &amp; South Wiltshire Branch of the WFA hosting representatives from the small village of Wootton Fitzpaine in West Dorset. Village historian Guy Brian and Parish Councillor Debbie Snook travelled to our meeting in Pimperne to be presented with a book to place in their village church telling the stories of ten men who were lost during the First World War and who are remembered on the village memorial. Martin and Judy Willoughby, Chairman and Secretary of the Branch, were determined to complete the research into the names within twelve months of the re-dedication of the memorial, which took place in November 2008. 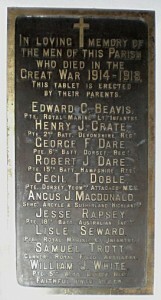 For “Time” had been the theme throughout the project to restore this unusual memorial which includes a clock, a bell, and a plaque on the 1920’s village hall as well as a tablet listing the men and their units which hangs in the village church. In undertaking this research challenge, with contributions from members of the Branch and the village, Martin and Judy wanted to provide a lasting reminder of the involvement of the Dorset and South Wilts Branch of the WFA in the memorial restoration project. As is always the case with historical research the job is never truly complete and the work on the history of those on the memorial continues as Martin and Judy try to get Angus MacDonald’s name added to the CWGC Debt of Honour register. 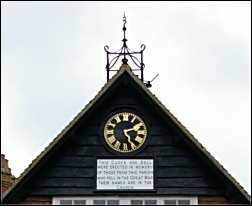 The clock and chiming bell, paid for jointly by the landowner of the local estate, Captain Alfred Pass, and the villagers, would have been a practical reminder of those lost. The hourly chimes could be heard over long distances by estate and farm workers, helping the many who did not possess a watch to keep accurate time when at work. 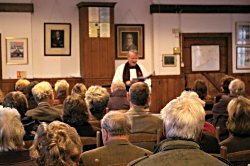 By Remembrance Sunday 2008, the scaffolding had been taken down and a small group from the Branch joined a packed gathering in the hall as the villagers came together for the re-dedication of their memorial. Judy and Martin laid a wreath on behalf of the Branch and after the service the villagers warmly invited the Branch representatives to join them for a celebration tea which included a selection of home-made cakes decorated to reflect, once again, the theme of time. PTE. DORSET YEOMANRY. ATTACHED M.G.C. Copies of the book are available for consultation by family researchers at the Dorset & South Wiltshire Branch WFA and the Keep Museum, Dorchester. Samuel was born in 1892 at Kilmington. At the time of the 1901 Census Samuel was living at home with his parents at Hawkchurch, Devon. Samuel’s father, Alfred, born in Hawkchurch, was employed as an agricultural labourer. His mother, Mary, came from Bristol. Samuel was one of six children, having three brothers and two sisters. Details of Samuel’s time in Wootton Fitzpaine are not known, but there were Trotts in the village through to the 1970s. Samuel arrived in France in July 1915 serving with 86 Brigade, RFA. 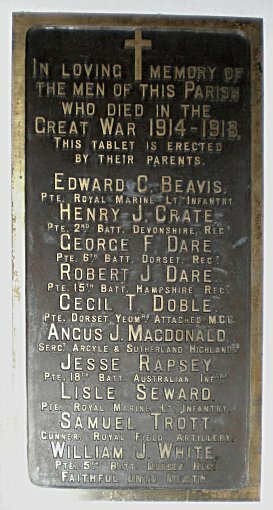 In July 1917 the brigade was having a pretty busy time. The third battle of Ypres started on the 31 July with a huge artillery barrage as the precursor for a major Anglo-French attack on a fifteen mile front. 86 Brigade played a full part, operating in the Zillebeke area. Despite the intense and prolonged barrage the enemy was active in producing counter battery fire and the war diary entry of the 1st August 1917 says “Battery positions heavily shelled during afternoon. 12 men killed in B/86 and 3 wounded”. The battery would have lost much of its gun crew personnel and the whole brigade was moved out of action for refitting on the 3rd July. Samuel was one of the 12 killed. 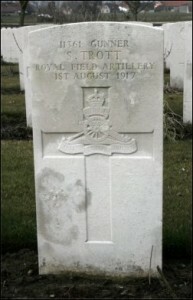 He is buried at Bedford House Cemetery, Ypres, Enclosure No 4, Plot VIII, Row D, Grave 33.